Authentic Italian Meat Sauce Over Pasta! Followed by Two Great Speakers & DJ Dance! This entry was posted in Activities, Events and tagged Italian Dinner Night on August 24, 2013 by theserenityclub. Buy Your Ticket or Donate a Bill W. Ticket Now! 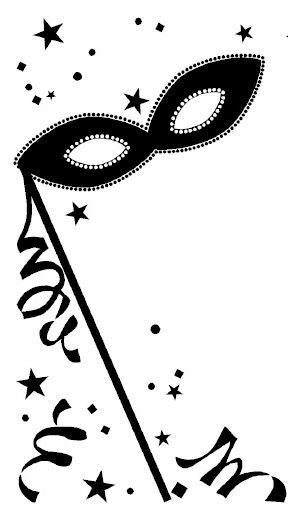 This entry was posted in Activities, Events, Uncategorized and tagged Anniversary Dinner/Dance, Serenity Club on July 17, 2013 by theserenityclub. Looking for Opportunities to be of Service?? Volunteers Needed to Help Make Our First Women’s Conference a Success!! Want to participate in a fashion show? Be a part of something wonderful! This entry was posted in Activities, Events, Uncategorized and tagged Sisters By The Sea, Volunteer on July 16, 2013 by theserenityclub. The Hotel Special Rates are finalized, the speakers are confirmed, we’re ready to begin Serenity by the Sea 2013. It’s our 5th Annual Serenity By The Sea. This entry was posted in Activities, Events, Uncategorized and tagged Sereinty By The Sea, Waldorf Astoria on June 9, 2013 by theserenityclub. It gives me great pleasure to personally invite you to join us next weekend for our Second Annual “Spring Fling!” Big Book Weekend with Bob D. (Las Vegas, NV). This will be an exciting and informative weekend for everyone as he takes us all through the “Big Book” of Alcoholics Anonymous at the Holiday Inn Fort Myers Airport at Town Center (Exit 128 from I-75). In addition, we have scheduled some “Early Bird” and “Night Owl” Open Discussion meetings with topics drawn from the pages of our beloved basic text. We will also have an AA Trivia Contest on Friday night, a Saturday night banquet with special guest speaker Phil H. (Largo, FL), and a DJ Dance later that same evening! There is still plenty of space available for this weekend event and for the banquet so I hope you will join us! A registration flyer is attached with this letter for your convenience, and more information can be found on our website at http://www.serenityclubswfl.org. You can also register for the event online and/or click the link provided that will take you to the Holiday Inn’s reservation site if you would like to book a room with them. Please feel free to call me on my personal cell phone at 239-776-6767 239-776-6767 if you have any questions at all. As a past registrant at our Serenity Club conferences, I know you will enjoy reconnecting with other previous event attendees and sharing the fabulous Food, Fun, & Fellowship that we are so famous for! The Serenity Club of Southwest Florida, Inc. This entry was posted in Activities, Events, Uncategorized and tagged Big Book Update, Serenity Club, Spring Fling on May 4, 2013 by theserenityclub. Join us for food, fun and fellowship as we welcome spring and celebrate recovery. This entry was posted in Activities, Events, Uncategorized on March 18, 2013 by theserenityclub. This entry was posted in Activities, Events, Uncategorized and tagged Big Book Weekend Workshop on February 4, 2013 by theserenityclub. Horseshoes, Volleyball, and Kid’s Games, plus an AA Speader Meeting at 1:00 pm. 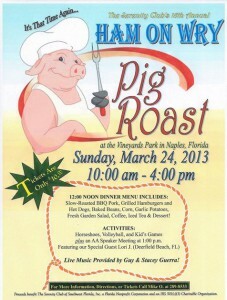 Live Music Provided by Guy and Stacy Guerra! 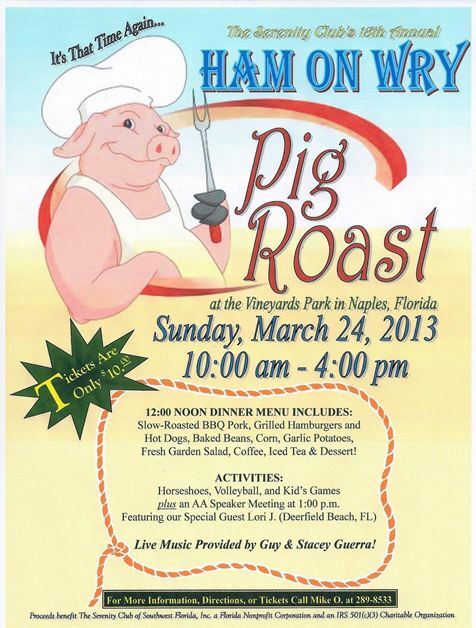 This entry was posted in Activities, Events, Uncategorized and tagged Ham On Wry, Pig Roast, Serenity Club, Vineyards Park on February 4, 2013 by theserenityclub. 7 pm Granny Callahan’s Corned Beef Cabbage with all the trimmings! 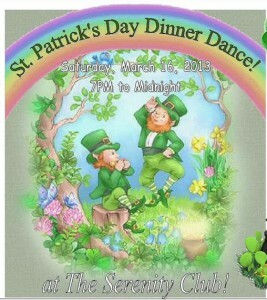 This entry was posted in Activities, Events, Uncategorized and tagged Serenity Club, St Patrick's Day Dinner Dance on February 4, 2013 by theserenityclub. Music and Dance from 10 pm- Midnight!! This entry was posted in Activities, Events, Uncategorized and tagged Serenity Club, Valentine Dinner Dance on February 4, 2013 by theserenityclub.